"We are the worst band on the planet." Archie pretty much runs Riverdale, acting as a mediator in lover's quarrels and an all-around best friend. He's great at those roles, but his performance as a musician leaves something to be desired. 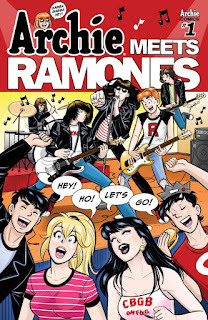 Good things The Ramones are around in Archie Meets Ramones from Archie Comics to teach him a thing or two. The issue is written by Alex Segura and Matthew Rosenberg, illustrated by Gisèle Lagacé and colored by Ma. Victoria Robado and Digikore Studios. When the Archies tank at the Riverdale High Battle of the Bands, a magical twist of fate sends them hurtling into the past—and face-to-face with none other than the Ramones! Can the legendary punks get the Archies to realize their own rock 'n' roll potential and find their way home? Probably not—but it'll be a blitzkrieg bop of a journey, as the two bands bounce from 53rd and 3rd to Rockaway Beach. 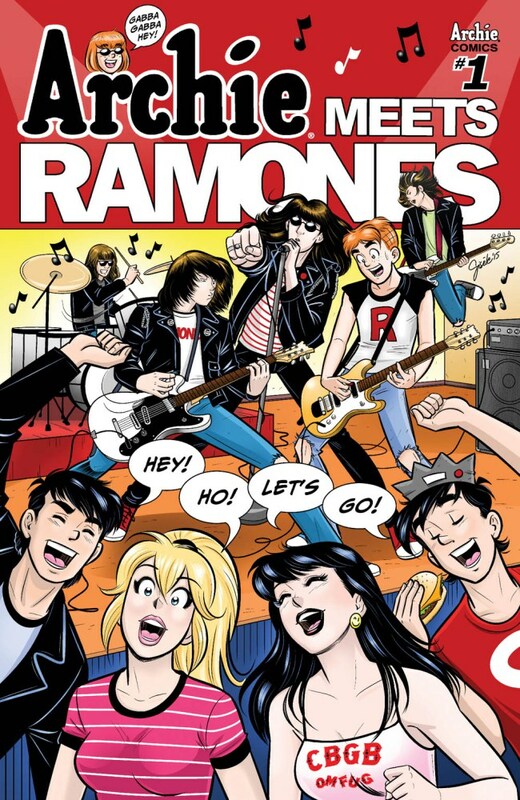 Segura and Rosenberg do their best to make the crossover between Riverdale and the Ramones feel natural and the inclusion of a Battle of the Bands is a good step in that direction. Having said that, the issue plays out in a way that feels a little forced at times, essentially moving the gang from Riverdale through all of the culturally significant locations and stops on a tour of the Ramones' ascension to punk fame. The script by Segura and Rosenberg is brisk enough where the reader doesn't necessarily have to be completely versed in the history of The Ramones and there's enough of the lighthearted Riverdale humor where this definitely feels like an Archie comic first and foremost. There are points where the pacing feels a little erratic as if Segura and Rosenberg couldn't really decide how to keep the crossover aspects relevant for the duration of the issue. Otherwise, all the main players from Riverdale are on in full-force as Segura and Rosenberg know exactly what makes an issue set in Riverdale really tick. Eschewing the more modernized style that the Archie Comics line has embraced is Lagacé's nostalgic linework. All the characters look readily recognizable and have the throwback look that popularized the franchise for so long in the past. The heavy linework accentuates the characters well as Lagacé ensures they stand out amidst the relatively empty backgrounds and against one another. The panel layout is extremely easy to ingest as Lagacé largely relies on standard grids with some insets and overlays mixed in. The colors by Robado nad Digikore Studios are very bright throughout the issue, leaning more on the Riverdale aesthetic than that of the typically dark and dour Ramones. Arche Meets Ramones is an odd crossover. The gang from Riverdale always finds themselves in interesting situations and Sabrina's abilities as a witch can make those situations even stranger at times. Segura and Rosenberg keep things light and decidedly in the tone of an old-school Archie comic. Lagacé's artwork is clean and an homage to the earlier art style that defined Riverdale. Archie Meets Ramones appeals more to fans of Archie than the Ramones, but it's an interesting crossover nonetheless that brings together two different universes that have pretty disparately different tones. Archie Meets Ramones is in stores now.